Carol Dean is a one-of-a-kind tile artist. 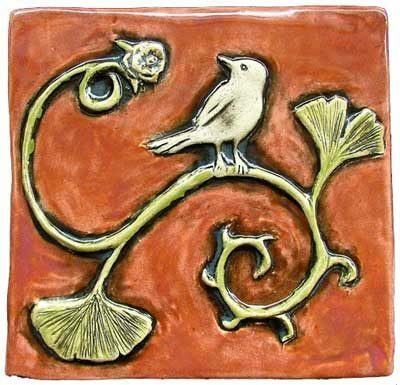 Her work is very distinctive, filled with traditional subjects of tile craft: animals, flora and fauna. But Carol's style is a contemporary take on these timeless themes. Rich colors and funky combinations, including: chickens and hearts, rabbits and palm trees, dogs and floating turtles! 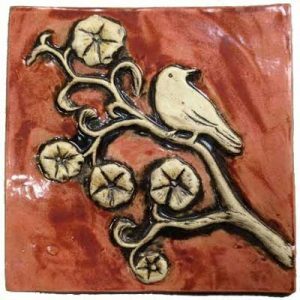 Carol makes her tiles with an impressive array of handmade stamps, glazing the tiles in rich colors. Even though she utilizes the same stamps again and again, each resulting design is one-of-a-kind through placement changes of the images and the variety of color combinations.